MEMPHIS, Tenn. (AP) — Kyle Lowry had 24 points and six assists, Fred VanVleet added 18 points and Toronto used a 3-point shooting burst in the fourth quarter to beat Memphis. VanVleet made all six shots on the night, including three from outside the arc in the fourth, when Toronto was 7 of 12 from 3-point range. Lowry was 5 of 8 on 3-pointers. Kawhi Leonard finished with 17 points and 10 rebounds, and Serge Ibaka scored 16 points as the Raptors won their sixth straight. DETROIT (AP) — Blake Griffin scored 30 points and Stanley Johnson added 21 to lift Detroit over New York. Reggie Jackson contributed 21 points for Detroit. The Pistons held New York to 40 percent shooting from the field and led throughout the final three quarters. 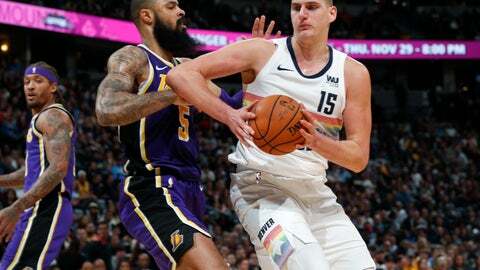 PHOENIX (AP) — Bojan Bogdanovic sank the go-ahead 3-pointer with 31 seconds to play and Indiana with a victory over Phoenix. After Bogdanovic’s long-range basket, Devin Booker’s attempt at a game-tying 3 barely rimmed out. Darren Collison’s two free throws wrapped up the scoring. Doug McDermott and Domantas Sabonis scored 21 points apiece for Indiana. Myles Turner added 16 and Bogdanovic 15. MIAMI (AP) — Taurean Prince scored 18 points, Trae Young finished with 17 points and 10 assists and the Atlanta Hawks held off the Miami Heat 115-113 on Tuesday night to snap a seven-game road slide. John Collins scored 16 points, Omari Spellman had 14 and Kent Bazemore finished with 12 for the Hawks, who are 2-0 against Miami this season and 3-16 against everyone else. Josh Richardson led Miami with 22 points, but his potential winning 3-pointer with 3 seconds left — a wide-open look — bounced off the rim. Dwyane Wade scored 18 and Wayne Ellington added 15 for the Heat, who have lost six straight at home. It’s only the 10th time in the 31 years of Heat basketball that Miami has lost so many consecutive games at home.